to see the Quilts and descriptions. instead of coming back to the main page pictures. in the Pennsylvania Dutch Country of Lancaster PA.
and hand-piecing of diamond and triangle patterns to get the good points. becoming more proficient, perfecting our favorite techniques. from past issues of McCalls Quilting Magazine. look different even though all three are made from basically the same pattern. patterns and techniques; and wow, do the quilts look different at the end! all the hand stitching: quilting the patterns and doing the applique. But is sure did make a great shower gift for my son's fiance! 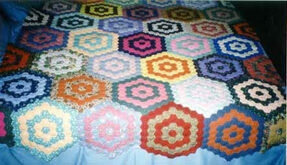 Next I worked on the "Roseville Quilt" by Maggie Walker. What a challenge that one was! Maggies quilts called "The Blue Collection"
As soon as I get some pictures taken, I will post them. I entered one of my quilts in a quilt show at a friend's church. It is called my "Friendship Garden Quilt"; and it was done completely by hand! over all the time we have been quilting together. 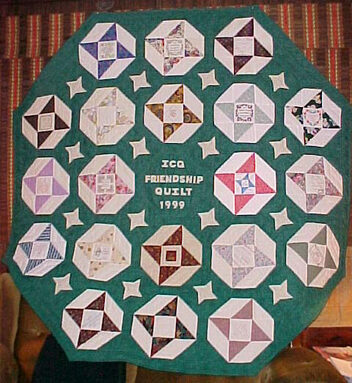 Well, here is the final picture of my ICQ Friendship Cyber-Quilt. And this is how I put them all together. and where all the gals came from. Thanks to all of you gals, for the lovely blocks! Lots of "Cyber Hugs" to all! I would love to include it in my Favorite Stories! And frayed from years of wear. With that old quilt tucked around me. Till she turned around and found me. That quilt with nimble fingers. I am also a member of several Quilting Rings. You will enjoy it, and find many new sites to travel to! I am so proud to have received this award for my quilting site! 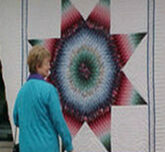 I love your Free Motion Quilting and Graphics Page too! It demonstrates a beautiful way to do quilted backgrounds.